Ever wanted to buy games like Infinity Blade, Grand Theft Auto III and the latest of the Need For Speed series on your iOS device, but the prices stopped you from doing so? Not anymore as the hottest games on the world’s largest app catalog are slashed down to very low prices. The price cuts on some of those games are good through January 1st, 2013, and some end even earlier so you should hurry up and get them sooner rather than later. Most of them are down to just a dollar, so it should not be a huge pain, don’t you think? Let us know if you’ve found others selling for a discounted price! OMG, most of the apps' I already have (on Android as an 'Android user')... lol But, congrats iOS'ers now you'll be 'rocking' some real games. Since there's no direct download link provided, be sure not to use Apple Maps to locate download, or you might wind up on Route 666. 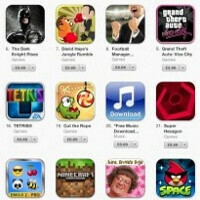 If you are talking about 'real games' then iOS is the only mobile platform you should have. Have you even played Infinity Blade? That is an amazing example of a real game on a mobile device. And to get it for $0.99 is a steal for a great game you will spend hours blocking, slashing, looting, and oggling at the amazing graphics. Please troll on other sites and stay away from phone arena. That wasn't even remotely funny, or needed.